Someone told me even numbers of bamboo stalks are unlucky, so I bought another pot with three stalks, bringing my total to 9. I had 3, that was good, then 6, disaster, now back to 9. “What does that have to do with?”my coworker asked. I was carrying my bamboo. Because obviously my life is ruled by Chinese numbers. “You seem unhappy,” someone said. Unhappy, and suffering, is not the same as inauthentic. Like at the end of the “Muppet Movie,” “We did just what we set out to do.” I set out to be a New Yorker, because I knew I was one, I am one, it fits. Everything else has been disastrousish: deserts of loneliness, boiling panic on 7th Avenue, back on the “rescue” drugs, back on the antidepressants– not that I mind the antidepressants, so much, they did me so right before, and going off only taught me they had no ill effects, and that going off them was easy. As long as sertraline and I fall back in love, I’ll stick with him forever. You lose your job but have to keep doing it for months, you get bad doctor news, you sell hard your life’s work: a lot for a brain. This time I knew to keep my eyes low, not to look up at tall buildings, of which there are, you know, a few, in Manhattan, and this time I was cool enough to walk through an Old Navy and look for t-shirts. I was at 9. Last time an H & M overstimulated me so bad I wanted to rip my chest open like Superman rips his suit off. I was at 10. When I said I wasn’t that bad, that with my first bout of anxiety I was afraid to leave the house, my therapist said, “Let’s not let it get that far this time.” Right. This round is much easier, as I understand the drugs, and the drugs help. To do what I intended to do, just do it with medicine. To not let my brain get the grooves carved that say, freak out here. I have a brain that acts out this way. And I don’t give in to it. I still move to a new city, I don’t quit my stressful job, I don’t stop writing. I get medicine. I don’t know if therapy for this has helped me at all, but I like therapy, so I go. I see nothing. We may sink and settle on the waves. The sea will drum in my ears. The white petals will be darkened with sea water. They will float for a moment and then sink. Rolling over the waves will shoulder me under. Everything falls in a tremendous shower, dissolving me. – Virginia Woolf, The Waves. 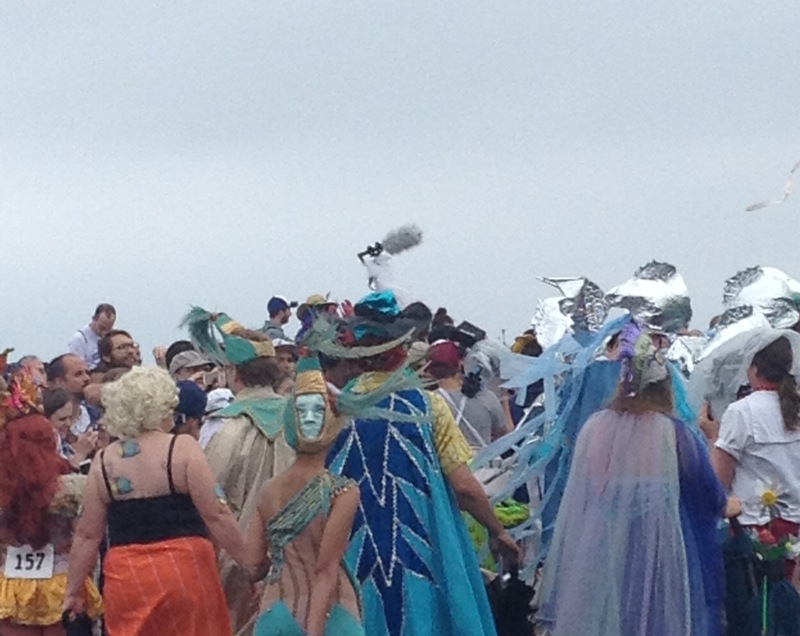 I marched in the Mermaid Parade last weekend. Marched? Walked with everyone, stopped and started, blew bubbles, waved ribbons around. I painted myself blue, which was much more work than I thought it would be, four big tubes of blue, four layers of paint. I had trouble with my face. I am experienced with Mardi Gras, and Mardi Gras always means masks. My sister helped make my face something. I didn’t know how to feel, there, handling the chiffon tails of my costume, the gangbusters of people, my first time at anything I am so self-conscious. I wanted to be the sea. Sequins are still being found on the bottoms of my roommates’ feet, and in the cat’s litter box. For a minute I was the sea. Image: “Ocean Swells,” Arthur B. Davies, Metropolitan Museum of Art.